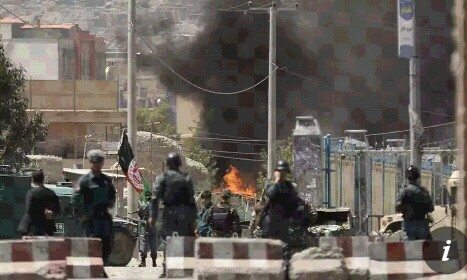 The Taliban have fired a pair of rockets towards the presidential palace in Kabul during a live broadcast by Ashraf Ghani to mark the Muslim celebrations of Eid al-Adha, police have said. It was also another blow to Ghani’s efforts to bring the insurgents to the negotiating table and hold peace talks to end the country’s 17-year war. The Taliban have been at war with the US-backed Afghan government for nearly 17 years, and have increased their attacks in recent months, seizing rural districts and carrying out major assaults against security forces and government compounds on an almost daily basis. On Monday, Afghan forces rescued nearly 150 people, including children, just hours after the Taliban ambushed a convoy of buses and abducted the passengers in northern Kunduz province. The quick response marked a rare if limited battlefield success for the troops. Earlier this month, the insurgents launched a coordinated assault on Ghazni, a strategic city 75 miles (120km) from Kabul. They seized several neighbourhoods, and it took security forces, aided by US airstrikes and advisers, more than five days to drive them out.